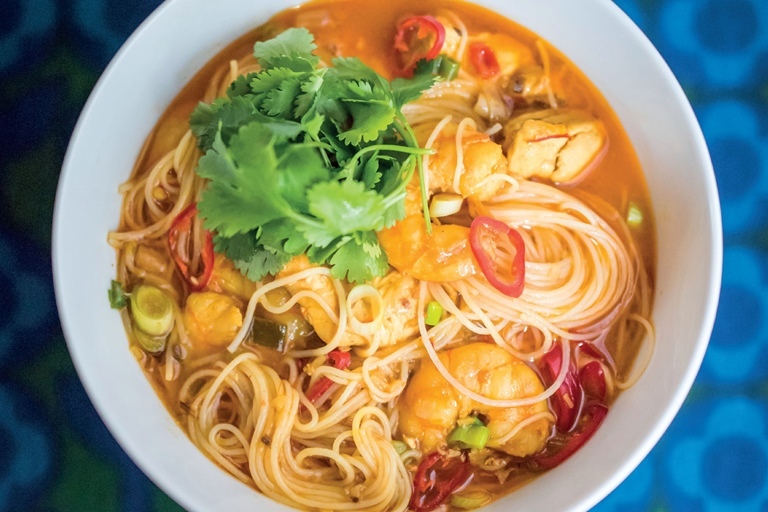 This spicy laksa recipe from actress and Celebrity Masterchef winner Sophie Thompson is made with rice noodles which makes it gluten free. It's a perfect meal for a mid-week supper as it's quick and easy to prepare. I am utterly mad about rice noodles, partly because I am one of those people with a bit of a pesky gluten intolerance. I couldn't believe it when I discovered them relatively late in life in a Vietnamese eatery in Soho. But like a new word, once discovered I realise they were everywhere and that, actually, you can cook them at home! JOY. So I do. Often. This is my version of a spicy noodle laksa.